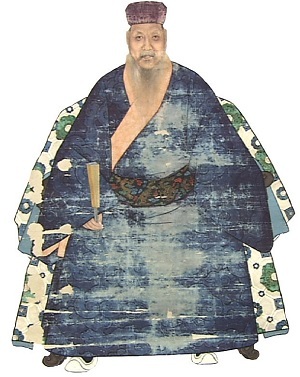 During his period of government service, Tei Junsoku 程順則 (1663–1734) traveled to Qing China four times, and one time to the Japanese capital of Edo. Later he was promoted to Sanshikan of the royal government in Shuri and awarded the post of principal administrator (sōjitō 惣地頭) of the lands of Nago, hence the title Nago Uēkata 名護親方. He also established the first Ryūkyūan state school called Meirindō 明倫堂, built at his own request in 1718 in Kumemura. Tīshimi suguritin, Chi nu za suguritin, Chimu do chimu sada me, Shike nu nare ya. This poem begins with the expression Tīshimi 手墨, that is, literally hand and ink. The same term is also found in a traditional island song (shima-uta) called Jūban Kuduchi 十番口説 (Ten Oral Teachings), stemming from the late 17th to early 18th centuries. Niban samurē nu dē ichi ya, Tīshimi gakumun yuku narati, Ufuya ni kōkō medei shushi. Here too Tīshimi is similarly interpreted as an equivalent to Bunbu-ryōdō. In Karate circles the first character Tī is considered to refer to a historical form of Karate. Similarly, Shimi – literally “ink” – is interpreted as the sciences, scholarship, the literary studies. In this way the expression Tīshimi is considered to be analogous to the term Bunbu 文武, that is to say, scientific scholarship and art of war in unitas. The theory that Tōdī developed from a previously existent Tī and the theory of the existence of the Bunbu-ryōdō 文武両道 (proficiency in scholarship as well as in the arts of war) in Ryūkyū to a large part are solely based on the above assumptions. However, the characters for Tīshimi were used to describe handwritten documents in ancient works of China, such as in the Songshu 宋書, the Xin Tangshu 新唐書, and the Chongzhong Lunwen Zhaibilu 重論文齋筆録. So, when was the theory of Tī first formulated? 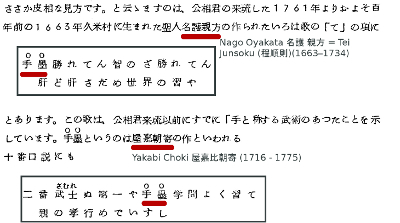 I don’t know exactly but the first time the above noted two theories on Tīshimi appeared in publication appear to be the article “On the History of Karate-dō” by Nagamine Shōshin, published 1966 in the magazine of the Karate-dō Study Group of Ryūkyū University. Nagamine Shoshin’s 1966 article (excerpt). In the future it would be interesting to find out more exact dates and references on the development of the theory of Tī. Because, and while it sure makes a great story, otherwise Tī will be dated back further and further with every new publication about the historical predecessors of Karate. So Nagamine’s 1966 article might serve as a first benchmark to work with. This entry was posted in Unknown Ryukyu and tagged Bunbu-ryodo, Juban Kuduchi, Nagamine Shoshin, Ryukyu, Tei Junsoku, Ti, Tishimi. Bookmark the permalink.